WASHINGTON — Secretary of State John Kerry warned skeptical lawmakers not to nix the contentious nuclear deal with Iran, insisting that it includes strict inspections and other safeguards to deter cheating by Tehran. “If Congress does not support the deal, we would see this deal die — with no other options,” Kerry told the House Foreign Affairs Committee on Tuesday as he testified for the second time in a week, part of the Obama administration’s all-out campaign to sell the accord. Kerry spoke as the administration picked up critical support for the deal from Rep. Sander Levin, D-Mich., a strong supporter of Israel who referred to his Jewish background in announcing his decision. “I believe the agreement offers the best option to prevent Iran from acquiring a nuclear weapon,” Levin said in a statement circulated by Minority Leader Nancy Pelosi, D-Calif., who is leading the effort to round up Democratic support for the deal in the House. “I believe that Israel, the region and the world are far more secure if Iran does not move toward possession of a nuclear weapon,” Kerry told members who, at times, blasted the deal. “Iran has cheated on every agreement they’ve signed,” said Rep. Ed Royce, the panel’s chairman. With Kerry, Energy Secretary Ernest Moniz and Treasury Secretary Jack Lew waiting to testify, he asked if Tehran “has earned the right to be trusted” given its history. Few, if any, new details emerged from the more than three-hour hearing. Some committee members asked the three officials questions, while others used their time to read lengthy statements in opposition. That left Kerry visibly frustrated and several times he accused the members of misconstruing or misunderstanding the details of the agreement. “Nothing in this deal is built on trust. 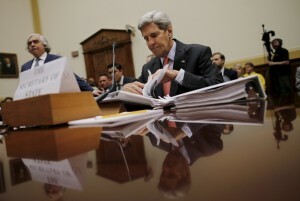 Nothing,” Kerry said. Kerry was asked what would prevent Iran from adhering to the agreement for a short time, and then, in effect, take the money and run toward building an atomic bomb. Kerry said that was not a likely scenario. He said the Iranian government is under pressure to improve the economy in their country where half the population is under 30 years of age and wants jobs. And he defended the inspection protocol under the agreement, arguing that if Iran tries to develop a nuclear weapon covertly, the international community will know. “They can’t do that. Because the red flags that would go off — the bells and whistles that would start chiming — as a result of any movement away from what they have to do” to meet their obligations under the agreement, Kerry said. Faced with Republican majorities in both houses, the administration’s objective was to line up enough support for Obama among Democrats in what is all but certain to become a veto fight this fall. Congress is expected to vote in September to prevent Obama from lifting sanctions imposed previously by lawmakers, a step that would likely cause Iran to walk away from the agreement. Obama has said he will veto any bill along those lines, and Republicans will need a two-thirds majority in both houses to override his objections. Engel is a strong supporter of Israel, which vociferously opposes the agreement. Iran has said it wants to wipe out Israel. The hearing unfolded as the American Israel Public Affairs Committee, a pro-Israel lobby, dispatched hundreds of its members to prod lawmakers to disapprove of the deal. On the other side of the issue, seven former U.S. diplomats and State Department officials sent a letter Monday to leaders in Congress urging them to support the pact. While lawmakers debated the implications of the deal, officials from member nations of the International Atomic Energy Agency told The Associated Press that Iran may be allowed to take soil samples at the Parchin military complex that is suspected as a site of nuclear weapon research, but only under monitoring by outside experts. The officials said stringent oversight of the soil-sampling could include video monitoring. The samples would be analyzed by the agency for traces left by any nuclear experiments. The disclosures come from IAEA member nations and are tasked with following Iran’s nuclear program. They demanded anonymity because their information is confidential. The IAEA had no immediate comment. Tehran insists Parchin is a conventional military area with no link to nuclear tests.